During our tertiary ophthalmic pathology practices in the UK and Singapore, we had independently observed serum IgG2 elevation in patients with IgG4-positive biopsies. The primary aim of this study was to determine if significant serum and tissue IgG2 differences existed between orbital IgG4-RD and non-IgG4 orbital inflammatory disorders (OID). This is a descriptive retrospective study of 69 cases of orbital biopsies from January 2002 to March 2016 performed with an institutional review board approval from the Royal Hallamshire Hospital, Sheffield, UK, and Singapore General Hospital, Ophthalmic Pathology Service. The H&E slides of these cases were reviewed, and immunohistochemistry (IHC) was performed for tissue IgG, IgG4 and IgG2 plasma cells. The antibodies included IgG (Dako, rabbit polyclonal antibody #IR512, 1:1000), IgG2 (Abcam, Singapore, rabbit monoclonal antibody #EPR4418, 1:2000) and IgG4 (The Binding Site Group, mouse monoclonal antibody #HP6025). Using previously published techniques,8 IHC was performed with single and dual staining for IgG4 (Leica Bond Polymer Refine kit) (diaminobenzidine) and IgG2 (Leica Bond Polymer Refine Red kit alkaline phosphatase chromogen). Using the 2012 published IgG4-RD histological consensus criteria,3 the presence of storiform fibrosis, lymphoplasmacytic infiltrate and obliterative phlebitis was determined.3 Inflammation was categorised as ‘sclerosing’ if 50% or more of the biopsy was occupied by fibrosis. Elevated tissue IgG4 was defined as IgG4:IgG ratio >40% and averaged tissue IgG4 plasma cells >50 cells/high-power field (hpf, 40×, field diameter of 0.55 mm) assessed in areas of greatest density of IgG4 plasma cells, over 3 hpf. However typically, the number of IgG4-positive plasma cells seen in the lacrimal gland is >100, in keeping with the consensus criteria findings.3 Similarly, the absolute tissue IgG2-positive plasma cells were counted on consecutive histological sections. The ratio of IgG2:IgG and IgG2:IgG4 was determined. Group 1: orbital IgG4-RD was defined as orbital IgG4-RD with/without systemic involvement and with/without raised serum IgG4. The exclusion criteria were evidence of autoimmune disorders (thyroid eye disease, Sjogren’s disease, granulomatosis with polyangiitis (GPA) and other specific autoimmune diseases). Group 2: idiopathic orbital inflammation was defined as non-IgG4 OID with non-specific histological features (with similar exclusion criteria as group 1). Group 3: autoimmune orbital conditions such as thyroid eye disease, Sjogren’s disease, GPA and other defined autoimmune diseases. Kruskal-Wallis test was used to compare serum and tissue IgG, IgG2 and IgG4 and their ratios among the three groups. Receiver operating characteristic (ROC) curve analysis was conducted to evaluate the diagnostic tests and to identify potential cut-offs to differentiate among the groups. Youden’s index was used to identify the optimal cut-off point. A total of 69 (38 Singapore cases; 31 UK cases) orbital biopsies were reviewed, with a total of 43 cases in group 1, 12 cases in group 2 and 14 cases in group 3. Patient demographics and results are summarised in tables 1 and 2. All the biopsies and serology were performed prior to corticosteroid therapy, except for patient 15 who received low-dose oral corticosteroid for treatment of acute tubulointerstitial nephritis secondary to IgG4-RD (diagnosed on renal biopsy prior to referral for a long-standing asymptomatic lacrimal gland swelling). The mean age of presentation in group 2 (38.1±14.7 SD years, p=0.01) was significantly younger than group 1 (57.1±13.9 SD years) and group 3 (53.5±19.1 SD years). No difference was seen between groups 1 and 3. A significantly higher percentage of Asians (Chinese, Indian and Malays) in group 1 was seen in contrast to the significantly higher percentage of Caucasians in group 2 (p=0.009). There was no significant difference in the racial distribution between group 1 and group 3. There was no statistically significant differences in gender across all three groups (p=0.052) despite a slight male predominance (60% male:40% female distribution) in group 1 in contrast to the 60% and 80% female predominance in groups 2 and 3, respectively. Chronic inflammation was present in all the cases (figure 1A–C,E). Group 1 was characterised by the presence of lymphoplasmacytic aggregates with reactive germinal centre formation, as described in the consensus criteria (figure 1A). Eosinophils were variable and present in group 1 and group 3 (figure 1C). Some cases in group 3 also contained neutrophils (figure 1E), a feature absent in groups 1 and 2. Xanthogranulomatous inflammation (figure 1F) was seen in 3 of 43 cases in group 1. Granulomas were present in group 2 (1/12 cases) and group 3 (5/14 cases) only. Histopathology in groups 1, 2 and 3. (A) Representative histology of group 1 (orbital IgG4-RD): dense lymphoplasmacytic infiltrate forming reactive germinal centres was the most commonly seen feature. 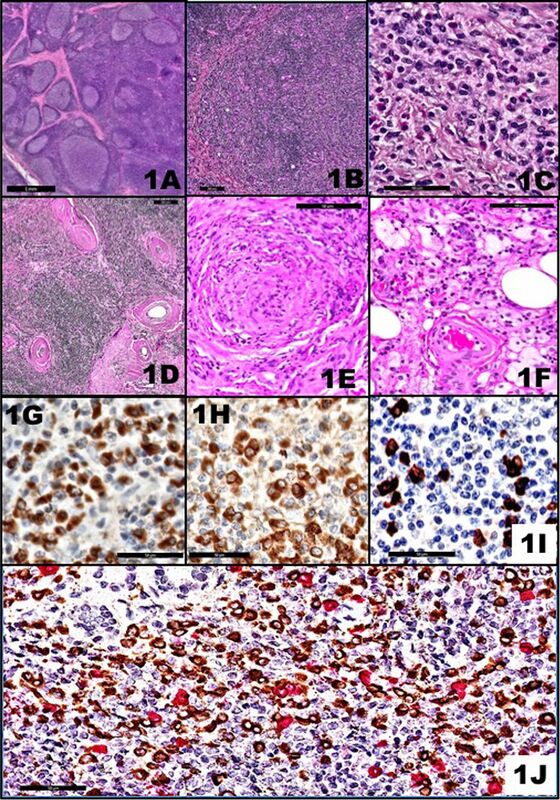 (B) Representative histology of group 2 (non-IgG4-RD ‘idiopathic’ orbital inflammatory disorder): diffuse chronic inflammation. (C) A higher power view of the lymphoplasmacytic inflammatory infiltrate typically seen in group 1 with variable eosinophils. (D) Lack of storiform fibrosis in group 1 (orbital IgG4-RD): hyaline fibrosis and non-obliterative perivenular fibrosis without active vasculitis. (E) Representative histology of group 3 (autoimmune orbital disorders). This is case 15 (granulomatosis with polyangiitis) with neutrophils and vasculitis. These features were absent in both groups 1 and 2 cases. (F) Xanthogranulomatous inflammation seen in case 10 of group 1. (G–J): IgG4, IgG and IgG2 immunohistochemistry in group 1, case 17. (G) IgG4 plasma cells >50 positive plasma cells averaged over 3 hpf (40×). (H) IgG plasma cells. Comparing (G) and (H), the IgG4:IgG4 >40%. (I) IgG2 plasma cells were 24 plasma cells averaged over 3 hpf (40×). (J) Dual immunohistochemistry, IgG2 (red chromogen) and IgG4 (brown, diaminobenzidine, DAB) show two distinct populations of IgG2-positive and IgG4-positive plasma cells. IgG4-RD, IgG4-related disease. Storiform fibrosis was not seen in groups 2 and 3, and only focally present in group 1 (figure 1D). When present fibrosis was predominantly hyaline, with sclerosing inflammation (>50% of biopsy) more common in group 1 (10/43) than groups 2 and 3 (4/26). Obliterative phlebitis was absent in all 71 cases, but perivenular inflammation (figure 1D) was seen in group 1 only. Vasculitis with/without necrosis was identified only in 6/14 cases from group 3. Both mean IgG2 and IgG4 serology were found to be significantly elevated in group 1 (tables 1 and 2, IgG2, p=0.002; IgG4, p=0.028) when compared with groups 2 and 3. In group 1, serological data were available for 47% (20/43) of patients. Of these, 45% (9/20) had elevated serum IgG2 subclass alone compared with the 25% (5/20) with IgG4 subclass alone. Twenty per cent (4/20) had both serum IgG2 and IgG4 subclasses elevation. Only one patient had raised serum IgG3 alone. Of note, 89% (8/9) of patients with IgG2 subclass elevation also had systemic IgG4 involvement, in contrast to only 60% (3/5) of patients with IgG4 subclass elevation and with systemic IgG4-RD involvement. In group 2, serological data were available for 67% (8/12) of patients. None of these patients had elevated IgG2 subclass elevation. Only one patient showed elevated IgG4 serology alone and only one had elevated IgG3 serology alone. In group 3, serological data were available for 36% (5/14) of patients. No patients had elevation of any of the IgG subclasses. In group 1, plasma cells expressing IgG2 were clearly detected in the tissues (figure 1I). These IgG2 plasma cells were admixed with IgG4 plasma cells and were without co-expression of IgG2 and IgG4 (figure 1G–J). IgG2 plasma cells were also detected in groups 2 and 3 (table 3 for mean IgG, IgG2 and IgG4 tissue counts). Tissue IgG2 plasma cells (IgG2, p=0.045) were significantly elevated when group 1 was compared with groups 2 and 3. Tissue IgG4 plasma cell count was significantly elevated in group 1 when compared with group 2 (Bonferroni adjusted, p<0.0001), but no significant difference between groups 1 and 3 was detected (Bonferroni adjusted, p=0.072). IgG2:IgG percentages between all three groups did not show any statistically significant difference (p=0.334). In contrast, IgG4:IgG percentage was significantly elevated between groups 1 and 2 (Bonferroni adjusted, p<0.001) and between groups 2 and 3 (Bonferroni adjusted, p=0.020), but no difference was seen between group 1 and group 3 (Bonferroni adjusted, p=0.127). In group 1, three patients (table 1; cases 15, 27 and 32) had IgG2:IgG4 ratios approaching unity with the tissue IgG4 plasma cells. In groups 2 and 3, 11/26 (42%) patients had an IgG2:IgG4 ratio >1, whereas in group 1, 100% showed an IgG2:IgG4 ratio <1. When IgG2:IgG4 ratio was compared between groups 1 and 3 (autoimmune disorders), the mean IgG2:IgG4 ratio was significantly lower (p=0.01) in group 1 (table 3). Similarly the IgG2:IgG4 ratio was also significantly lower (p<0.0001) in group 1 when it was compared with group 2 (idiopathic orbital inflammation). As serum IgG2 and tissue IgG2 plasma counts were found to be statistically significant between group 1 and both groups 2 and 3, the ROC curve/area under curve (AUC) was used to identify potential cut-offs to differentiate between the groups (table 4). A serum IgG2 cut-off >5.3 g/L was found to give a sensitivity and specificity of 80% and 91.7%, respectively, for differentiating between group 1 and groups 2 and 3, with an accuracy of 0.90. Our results confirmed our observational impression and confirmed a higher percentage (65%, 13/20) of orbital IgG4 cases with serum IgG2 elevation in comparison with none in the idiopathic orbital inflammatory and autoimmune cases (0/13 cases). The statistical analysis revealed a significant twofold elevation of serum IgG2 in orbital IgG4-RD cases when compared with idiopathic non-IgG4-RD, autoimmune disorders. Being a retrospective study, not all serological data were available either due to lack of availability (at time of diagnosis), or even when suggested by pathologists was not carried out (lack of availability and cost constraints). Despite this limitation, ROC/AUC statistical analysis suggests serum IgG2 to be a useful surrogate serum marker for IgG4-RD, with an accuracy equal to serum IgG4 (table 4). Although further retrospective and prospective studies will be required to validate this, serum IgG2 may be particularly useful in 30%–40% IgG4-seronegative patients. The presence of tissue IgG2-positive plasma cells could be clearly demonstrated by IHC (figure 1). The IgG2 plasma cells were admixed with the IgG4 plasma cells in every case examined, suggesting a common inciting stimulus. It was beyond the scope of our study to determine if our findings represented the emergence of two distinct IgG2 and IgG4 plasma cell populations or one undergoing subclass switch from IgG2 to IgG4 or vice versa, although the lack of plasma cells co-expressing IgG2 and IgG4 subclasses appears to favour the former. The increased tissue IgG2-positive cells (IgG2 >50 cells/hpf, p=0.023) in orbital IgG4-RD when compared with idiopathic non-IgG4-RD and autoimmune disorders imply that IgG2 is not a passive player in IgG4-RD. Since this study was completed, we have also observed IgG2 plasma cells outnumbering IgG4-positive plasma cells in non-orbital IgG4-RD, supporting the possibility of IgG2-positive plasma cells being a central player in this fibroinflammatory process and perhaps with a more systemic influence (similar to the elevated serum IgG2 observation). Serum IgG2 is the second most abundant subclass of IgG in the serum and is usually formed as an immune response to bacterial capsular polysaccharide antigens.9–11 The IgG2 subclass is therefore an important defence mechanism against bacterial infections, such as Streptococcus pneumoniae, Haemophilus influenzae and Neisseria meningitidis, and its deficiency is associated with increased susceptibility to such infections leading to chronic sinopulmonary infections.10 11 In contrast to IgG2, IgG4 is the least abundant subclass found in the serum. Similar to IgG2 deficiencies, its deficiency is also associated with chronic sinopulmonary infections.11 12 Thus, both these IgG subclasses appear to share potential common aetiologies. Currently, the role of IgG2 serum elevation in IgG4-RD is not known. In orbital IgG4 inflammation, we noted 89% with elevated serum IgG2 also had evidence of multiorgan involvement by IgG4-RD and of this group, suggesting that serum IgG2 may be a biomarker of multifocal organ involvement by IgG4-RD. In addition, many of these were of South East Asian (SEA) ethnicity suggesting a possible genetic background to this possibly heightened response in SEA patients. However, given the small numbers in our study, this postulation will require further confirmation. Others have reported that the IgG subclass undergoes temporal class switching in an ordered fashion from IgG3 to IgG1 to IgG2 to IgG4, with IgG2 and IgG4 being the later formed IgG subclasses.13 Immunoglobulins undergo affinity maturation during an immune response via class switching by somatic hypermutations and class switch recombination.13 The latter allows for the immunoglobulin constant region to switch to one of the four IgG subclasses. On the other hand, increased somatic hypermutations in the immunoglobulin variable regions have been shown in germinal centres to effect the sequential IgG subclass class switching.13 Although our study is purely observational, our serum IgG2 findings where the majority of the IgG4-RD cases show serum IgG2 without IgG4 serum elevation appear to corroborate this temporal IgG programmed class switching. This suggests that serum IgG2 may rise prior to serum IgG4, and perhaps our lack of IgG4 serum detection reflects a later class switch. The lack of statistically significant elevation of IgG1 and IgG3 among our three groups, while acknowledging the limitations of the dataset, is consistent with the idea that IgG1 and IgG3 class switch to IgG2 and IgG4, and suggests that IgG1 and IgG3 are unlikely to have a significant contributory role in IgG4-RD or orbital idiopathic and autoimmune disorders. Published data on IgG4-RD have shown little correlation between serum and tissue IgG4 plasma cell counts.4 14 15 Our study also found a wide range of tissue IgG2 plasma cells with no distinct correlation with serum IgG2 similar to IgG4 subclass findings in IgG4-RD, suggesting that both tissue IgG4 and IgG2 subclass plasma cells in IgG4-RD may be a tissue response to a possible common inciting agent, perhaps with a serum IgG4 and IgG2 elevation representing a spillover response. Although this needs to be clarified, it is an interesting hypothesis for consideration. Current literature has reported significant IgG4-positive plasma cells in a wide variety of autoimmune and lymphoproliferative conditions.16–20 Similarly, in our study, comparing IgG4 plasma cell counts between IgG4-RD and autoimmune disorders showed no significant differences (p=0.072), emphasising the need to exclude autoimmune causes before diagnosing IgG4-RD. In our study, we noted that IgG2-positive plasma cells were also present in non-IgG4-RD OID and autoimmune conditions, suggesting that, just like IgG4, IgG2 plasma cells are not specific to IgG4-RD. This strengthens the notion that the two are linked in a common pathogenesis, yet emphasises that interpretation of IgG2-positive plasma cells in tissue biopsies must be approached with the same level of discernment as for IgG4-positive plasma cells to avoid overinterpretation. It is also interesting to note that a higher IgG2:IgG4 ratio was seen in the orbital autoimmune disorders, which usually have a more aggressive clinical course than orbital IgG4 and idiopathic orbital inflammation. Together with the presence of a higher percentage of elevated serum IgG2 in orbital IgG4 with systemic involvement, these findings again highlight the possibility that IgG2 may be associated with a more chronic and/or systemic disease process that is worthy of future larger scale studies for validation. This study has several limitations, the first and most obvious being the absence of serological data for reasons as previously discussed. Second, the smaller size of groups 2 and 3 and the different numbers across all three groups limit our study despite our attempts to adjust for this in the statistical analysis. However, there are several qualitative and semi-quantitative observations of note that are worth pursuing in larger studies to clarify the significance of IgG2. In summary, our study describes a significant association of serum and tissue IgG2 subclass with IgG4 orbital inflammation. Although future studies are required to define their role, we have postulated on its potential role in the pathogenesis of IgG4-RD, which leads to the question on what IgG4-RD actually is. Would an alternative terminology of ‘IgG subclass disease’ (with documentation of the proportion of IgG2 and IgG4 plasma cells within the biopsy) be a more accurate and better reflection of the histology and IHC findings? When the percentage of IgG2 and IgG4 expressing plasma cells is added for each patient with orbital IgG4-RD, 58% (25/43) have a total of IgG2+IgG4 plasma cells >90%, compared with 0/12 for idiopathic OID and only 36% (5/14) in orbital autoimmune, suggesting that a composite IgG2 and IgG4 subclass score may represent a useful parameter in further studies for determining its significance. The authors thank the oculoplastic and orbital surgeons from the UK (Dr Sachin Salvi, Dr Zanna Currie, Dr Jennifer Tan and Dr Omar Hadid) and from Singapore (A/Professor Seah Lay Leng, Dr Choo Chai Teck, Dr Audrey Looi, Dr Morgan Yang and Dr Livia Teo) for the biopsies and clinical information.